Round 2 Of The Ultimate Super Bowl Snack Playoffs Starts NOW! Vote! Sanity is not this bracketeer's strong suit. Speaking of insane things! You all went gloriously bananas. It was great. Among the top comments are accusations of communism, terrorism and illiteracy. And someone called me a harpy! Bless. Those of you who were too blinded with "WHERE ARE THE PIZZA ROLLS/WINGS/CHILI???" 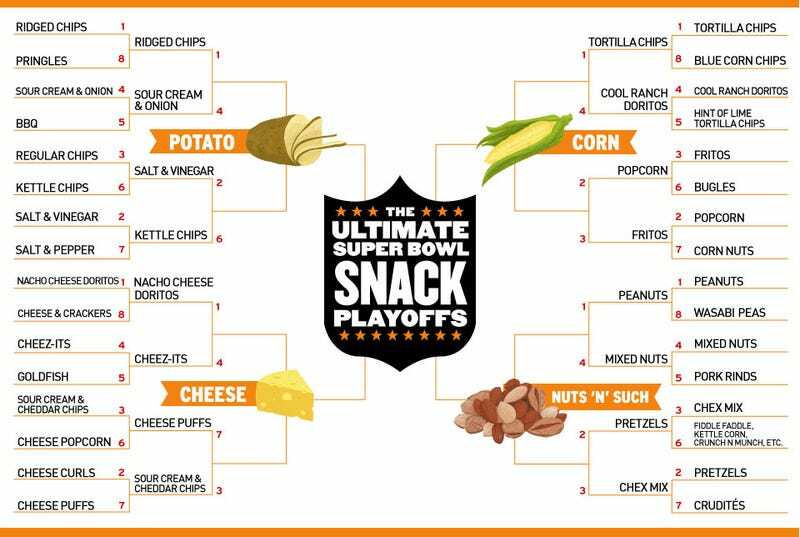 rage to get mad about crudités, fret not: Next year's bracket will be devoted to the more substantial Super Bowl foodstuffs. Those of you wondering where the God damned queso is, it's right here in last year's bracket, which was devoted entirely to dip. Those of you who are still so mad (SO MAD!!!) about tzatziki, please know that I love you most of all.